Walvis Bay Port and Durban Port are natural gateway to International Trade serving vehicles and containers destined for Zimbabwe, Zambia, Botswana, and other southern region countries. We have agents at the port to assist with port clearances and releases from Namport Port Authorities. 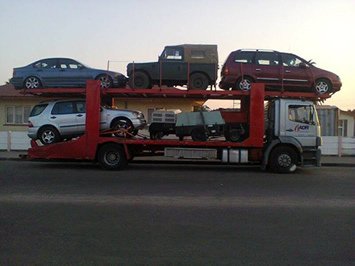 Our car carriers are waiting to deliver cars to Plumtree border or Beitbridge border post. With very competitive rates and timeous dispatch let us take the hassle of long tiring journeys driving home. loss of valuable time plus hidden costs on a 5000km journey to and from Walvisbay, ie. hotel bookings, food, fuel etc. *You avoid – new faults, dents and repairs that may result from the long drive. *You avoid – risky driving, underhand costs and excess mileage resulting from a 2500km trip to Harare (this road is heavily laden with animals) *We assist in paying duty on your behalf at Plumtree border post delivery of vehicle can be arranged on request. OUR RATES ARE AS Above ; and please note vehicles should not be loaded.